Frank Sinatra Signed Contract - Extremely Rare Recording Contract on Capitol Records onionskin paper. 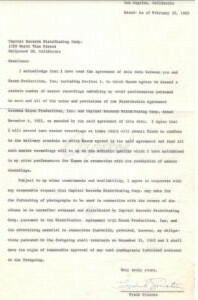 This is a 1-page 1960 agreement (approx size 15 x 10) between Sinatra and Capital Records "in which Essex (Productions) agrees to record a certain number of master recordings embodying my vocal performances pursuant to each and all of the terms and provisions of the Distribution Agreement between Essex Productions, Inc. and Capital Records Corp. dated December 6, 1955, as amended by the said agreement of this date. I (Sinatra) agree that I will record such master recordings at times which will permit Essex to conform to the delivery schedule to which Essex agreed in the said agreement and that all such master recordings will be up to the artistic quality which I have maintained in my prior performances for Essex in connection with its production of master recordings." Nicely signed in blue ballpoint to the right hand corner by Sinatra, this is obviously a significant document!! With as high as 95% of all Frank Sinatra autographs being forgeries in the marketplace (even higher on eBay) here is a RARE opportunity to own a genuine Sinatra autograph on a historical document. We have been seeing a dramatic shift UPWARD of the value of Authentic Frank Sinatra autographs. Weather or not this is due to high demand, the low supply, the flood of forgeries on Ebay or a combination of all three we can only speculate. Larger Autograph dealers like Fraser's Autographs or History Direct sell a piece like this for $3500-5000. Just check out their web site.